A hybrid phone switches between WiFi and cellular data automatically in order to minimize cost and maximize signal clarity. Project Fi started out with two cellular carriers, Sprint and T-mobile. Now it has a third, U.S. Cellular. The additional coverage means Fi phones will work better in more places. 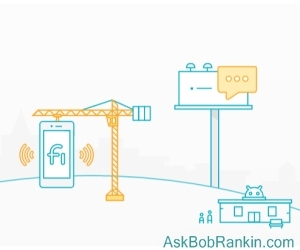 The cost of the first Fi line added to a Google account is still just $20 per month for unlimited domestic calling and text; international calling is also unlimited and rates are very low. Even better, you can now add up to five more lines (for a total of six) for just $15 per additional line (plus taxes and fee). Google calls this feature its “group” plan instead of the traditional “family” plan, recognizing that many people share a phone bill with non-relatives. There are no contracts, and customers can add or subtract lines monthly. The master account can manage and monitor subsidiary accounts for easy accounting and accountability of users. Data is still a nice, simple, and generous $10 per gigabyte. If you use more, you’re charged a prorated $10/gigabyte, e. g. $1.00 for 100 MB, not the eye-watering punitive overage rates of other firms. Unused data is credited to the next month’s bill. Oh, and there's no annual contract required. So you're not locked in by the threat of an "early termination fee." Project Fi works only on Android phones manufactured under the Google brand. At first, only one phone was supported, the Nexus 5. Today Fi supports the Pixel and Pixel XL, Nexus 5X, Nexus 6P, and Nexus 6. That's because the phone must have the special hardware that enables seamless switching between multiple mobile carriers. Curiously, Nexus phones are available only during the Fi signup process; you will find only Pixel phones in the Google Store. Check out the Project Fi ready phones and pricing here. Never, ever re-sell a Google phone! In November, Google took some pretty draconian action against about 200 buyers of its Pixel phones. These buyers ordered extra phones and had them delivered to a reseller in New Hampshire. The reseller marked up the prices and then split the savings with the buyers. This arrangement, which the reseller says he’s used for years, turns out to be a violation of Google’s terms of service, which forbid commercial resale of Google phones. Google canceled the Google accounts of buyers it found to be in violation. They could no longer access their Gmail accounts, Google Drive data, YouTube accounts, Google Photo, etc. That’s a “digital death penalty” for many people. Fortunately, Google relented after only two days, and reinstated all of the banned users. One new development is that existing Fi customers can add data-only devices by purchasing a mini-SIM for each device. Non-Android phones, tablets, laptops, and other devices are supported. All data-only devices share the master device’s data budget. (So yes, you could add a non-Google phone, such as a Samsung Galaxy, to your Fi account. The catch is that you'd be limited to data-only. But Google Hangouts lets you call and test over WiFi, so there are interesting options here.) The original Fi offered only WiFi tethering; now, other devices don’t have to be anywhere near the master device, and cellular data is an option when WiFi is not available. You might be thinking that Project Fi's hybrid WiFi-cellular network is similar to Republic Wirelesss, a company I’ve covered before. (See my article [BYOP] Republic Wireless Just Got Better) Republic Wireless does have the ability to switch between cellular data and wifi signals, but it only supports carrier. On the flip side, it supports more phones than Project Fi. Whether it’s cheaper than Republic Wireless and other mobile carrier plans depends on how much data you use. If you're a typical user who consumes about 2GB per month, you'll save $35-$40 per month as compared to Verizon or AT&T. With credit for unused data, the savings could go higher. Here's a down side for some -- Project Fi is not fully compatible with Google Voice. If you sign up for Fi with a Google account that includes Google Voice, you will have the option to port your Google Voice number over to the master Fi phone. (Alternatively, you can use the phone’s native number or port the native number from your Google Voice phone.) Many of Google Voice’s features are built into Project Fi, but users will lose the abilities to use the Google Voice web site to make or receive calls and to send texts. If you cancel Project Fi, you can bring the number you were using back to Google Voice. If you want to keep Google Voice on your existing Voice number, Google offers a couple of options. Most recent comments on "Should You Switch to Project Fi?" I've been a Project Fi customer for nearly a year now,and enjoy the lower cost.Since most of my usage is over WiFi, I've yet to have a monthly bill over $22.48. That's the upside. The phone works great in larger markets with 3G and 4G coverage. It's not so great anywhere else. Case in point. When we had AT&T phones or Verizon, we Verizon coverage, we rarely hit dead spots when on the road to Montana. With Project Fi phones, you pretty much have to stop at places with WiFi to catch up on texts, make calls,etc. This is because there are vast swatches of Montana, and lots of other states in the West, where coverage is 2G at best. I would recommend Project Fi to anyone who wants inexpensive cell coverage if they are in areas with multiple carriers supported by Fi. It does not take longto gethooked ont he savings! Too restrictive on phones and area to be useful. I had ATT phones (Samsung) and my husbands screen failed 2.5 weeks before the end of the contract. It was going to cost us a bundle to replace the phone (not eligible yet for a new phone on current contract). It still cost a bunch for early termination as he could not go without a phone for 3 weeks. We were paying between $108-$125 a month on a family plan depending on data usage and that included my corporate 'discount'. We are nearing the end of our first year of Project Fi and have almost paid for our phones with the difference in cost. Our current bill typically runs between $22-$27 per month per phone. We are both extremely happy with the phones and coverage (but we do not drive in Montana). I would recommend looking at coverage maps for the three current Fi carriers to see if they provide enough for where you live/travel. We have been extremely pleased with the phones we have (Nexus 5x) and the cell coverage in all the areas we have been in. Project Fi has been a great deal for us. Since that is the Google project you'll get the original Android without any bloatware and completely compatible with anything (HTC One M8 from AT&T was unable to connect to my car bluetooth and to computer through USB for backup). The updates also comes to you first. But I didn't get Google Assistant with last Android 7.1.1 update - it's for Pixels only. Another nice feature is transcript of your voice mailbox. Mostly I don't need to call my voicemail, I read transcripts. I was surprised how accuarate they are. You can keep your Google Voice by creating another Google account and transfering it there (use Bob's link about "couple of options"). If you have some money at that account, it comes to Project Fi. About phones - you can buy them not only from Google - I saw them on sale in Fry's Electronics, B&H (I bought mine at Google sale for $199/249 - 16/32Gb for Nexus 5X) and prices pretty good too (usually $10-20 more, than Google sale prices). About coverage - I live in Los Angeles and practically always with T-mobile (Sprint - a couple of times). With friends we traveled across the US from New York back to LA and also whole trip was in T-mobile network (except dead spots, where mostly anly Verizon worked). Twice there were glitches - I lost Internet access, called Project Fi customer service that worked great (reboot fixed the problem) and in Starbucks was unable to connect until turned off Data Saver. Transfer to Project Fi worked for me flawlessly and was I'd say, instant. So overall I like Project Fi. You forgot to mention that international roaming for data doesn't cost any extras - same $10 a Gig. You mentioned that Fi was originally only available for GoogleNexus 5. I believe that is incorrect. Nexus 5 phones (which I have) do not work on Project Fi. I am considering switching to this. Worst case? I can always go back to Cricket (AT&T network), which has excellent coverage. I and the rest of my family have been using Project Fi phones for the past year or so. The phone and the MVNO Carriers are good now in about 136 countries, the rest we don't plan to go. Anyway, when we land in another county, we turn on the phones and the the message on them of "Welcome to (name of country), use your phone just like at home" appears AND IT WORKS! The only additional item is that you have to turn on Data Roaming, otherwise, the devices and system performance has been stellar! I have been using Fi for about a year down in south Louisiana. I travel for business and have found a few dead zones but mostly I have great coverage. The switching between carriers or to WI-FI has been seamless with only one glitch that "belched" but did not drop my customer's call. I am using the Google LG Nexus 5X which has been AWESOME for me. The 2GB ram has NEVER been an issue. The plastic case is another non-issue - I added a "drop-proof" case as soon as I bought it (as I ALWAYS do with my cell phones). The phone came unlocked - NO JUNKY BLOATWARE!!! - and gets updates quickly. I started with Android 6.0 and recently went to 7.1.1. My data usage is always low though I have to use it constantly for WAZE or customer info. My wife on the other hand NEEDS to stay with her $45 per month 5GB data, unlimited plan as she is constantly watching videos, playing music, etc. Her bill with Fi would be around $70 per month vs the $45 she pays now - NOT a good fit. NOTE: the only bad thing is I am now in bed even more with GOOGLE. I found Fi on my newish Nexus 6P recently and looked into local options (Edmonton, Alberta). It said it supported only 2G. I'm guessing 2G is old and slow. Does this make sense? I guess I am satisfied with Republic Wireless and the T-Mobile service they provide. RW offers free roaming with AT&T and I never pay more than $22.83 a month for 1 gig of data and unlimited talk and text. H2o Wireless has been fantastic for me. I signed up for the 3GB/unlimited plan for $40 with a 10% discount for auto-charge. So I pay $36/month ALL-IN for the best service I've had in the area (Boost and T-mobile were bad). Now, they bumped the plan to 8GB data/month. I can downgrade to the new 3GB plan for $27/month but haven't had time yet. ANY sim card phone will do. NO overpriced specialty phone needed. Add Apple and I'm in. It's been slightly mentioned, but wanted to highlight is that it pretty much works seamlessly out of the US. Phone and data work just like you're at home, with the same rates for data (phone is more). And, you can make 'free' phone calls if you are on wi-fi; when on wi-fi, there is no charge for calling.